In a little over a month my wife and I will be returning to the place we regard as our second home (financial considerations dictate that it will never be our first) – San Francisco. In fact, this will be our twentieth anniversary since we first laid eyes on the imperious Golden Gate Bridge, sampled clam chowder in a sourdough bowl or cracked open a fortune cookie in a Chinatown restaurant. After our initial trip in 1995 ( http://www.tonyquarrington.wordpress.com/2014/11/04/you-were-so-right-louis/ ), it would be another three and a half years, and a further three years after that, before we settled into what became a routine of bi-annual visits. We would combine our stay in the city with a skiing trip to Tahoe and a few days elsewhere, such as Las Vegas, San Diego, Death Valley and Yosemite. Invariably, after the eleven hour flight, we would stay the first night in a budget hotel, having dinner at Calzone’s on Columbus Avenue (but not without a visit to Tower Records first), followed by drinks at the Vesuvio Café nearby. Breakfast would be taken at the Eagle Café on Pier 39 the next morning, and I would buy my holiday reading at the Barnes and Noble bookstore (now long since closed) in Fisherman’s Wharf before driving over the Bay Bridge. On returning to the city we would stay in a hotel, making the small step up (or was it down) from the Tenderloin to the Civic Center on our second trip before heading to the Holiday Inn at the Wharf for three of the next four vacations. With each passing visit, we became less inclined to rush around ticking off the guidebook highlights, and began to venture off the beaten path and discover those places, within the city and wider Bay Area, where the only (other) tourists we might encounter were getting wind burn from the top of a tour bus. It didn’t concern us that we hadn’t jumped a cable car for five years, stepped foot in Nordstrom or Macy’s or taken the rough ride across the bay to Alcatraz. Of course, we didn’t avoid all of the more celebrated spots, always finding time, however short the vacation, to eat at the Cliff House, shop on Haight Street, drink in North Beach and ramble round Golden Gate Park on a Sunday afternoon. San Francisco quickly became the place where we wanted to live. Without the riches required to buy our way into residency, we would have to content ourselves with alternating between staying in the city (spring and autumn) and the UK (winter and summer) for three months at a time – and only then when we had both retired. For now, it was a matter of a week here and a fortnight, and, more recently a month, there. We wanted to “live like locals”, and staying in someone’s (second) home was a good starting point. There would be no maids knocking at the door in the morning anxious to clean the room, no loud, drunken conversations outside the room at 3am and no lift bells ringing or washer / driers humming at all hours. So in 2010 we abandoned the lazy predictability of hotel living and rented an apartment in Hayes Valley, following that up a year later with similar accommodation in the Western Addition, a short stroll from Alamo Square. The migration west from downtown, however, took a sunny south easterly turn in 2012 when we chose Noe Valley for our base. It was during our second residence there that we discovered Bernal Heights ( http://www.tonyquarrington.wordpress.com/2013/06/16/a-hike-up-bernal-heights-hill/ ). Much as we had enjoyed living in the other neighborhoods, we immediately felt an affinity with the quirky, artsy, small town feel of Bernal and rented a cottage there last year. Our first impressions confirmed, we will be returning to that same cottage twice this year for a total of six weeks. It might not have gone unnoticed that our original bi-annual visit strategy has now become annual – and, at least for this year, twice a year! Over the past two decades, our time in the city has taken on a different, more relaxed tenor. It has become a familiar and habitual part of our lives, somewhere we have now spent more of our time than anywhere else, other than our permanent UK address. Moreover, we try, as befitting aspiring locals, to engage more with the city and its residents on a regular, deeper level. During those interminable months in which we are incarcerated nearly six thousand miles away. we maintain a daily interest in the life of the city, and indeed, I comment on it in a number of online forums. In addition to my Facebook presence, through which I now enjoy a number of personal as well as virtual friendships (even bumming (pun intended) prime seats at AT & T Park to see “our” Giants), I started a blog on the last day of 2010 which focuses on the history, culture and characters of San Francisco. And I plan to explore our experiences in more depth in my upcoming book Smiling on a Cloudy Day: An Englishman’s Love Affair with San Francisco, scheduled to be published towards the end of this year. In our temporary home in the city we neither have to pretend to be what we are not, nor do what we or others feel we ought to do. We can watch the Bay Area news on KRON4 while catching up on household chores in the morning, stroll out to a neighborhood café for brunch, swing by the local wholefoods store and return to the apartment for a bottle of wine on the patio. All dining options are also possible. We might have dinner in the apartment or we might try out one of the local restaurants. Or we might brave Muni on a trip downtown and eat in Chinatown or North Beach – or even Union Square. We are under no pressure to conform to a set tourist pattern. What has happened is that our version of San Francisco has shifted, not only geographically but also psychologically, from the waterfront to the southern neighborhoods. In a sense, our journey has mirrored the historical expansion of the earlier city residents from Yerba Buena Cove to the hills. But, of course, there is still room for those sights that first enthralled us as much as they have millions of others. They are still only a short drive, bus or taxi ride – or even walk – away. We still make a conscious effort to revisit those attractions we might have neglected on recent trips – for example we plan to explore Coit Tower and Grand View Park again after an absence of a few years – as well as sampling new locations altogether such as Glen Canyon, Dogpatch and Potrero Hill. If that sounds as if living in San Francisco has become routine, less exciting, even a chore, that could not be further from the truth. We have become, in a modest way, San Franciscans, interested in its history, politics, culture and, undeniably, its sport (Go Giants!) – just as we do at home. Increasingly, our hosts marvel at our knowledge of, and adoration for, the city. I doubt, however, that the more strident members of online forums would agree with Caen’s loose, but characteristically generous, sentiments here, but I like to feel that we have moved beyond being “sophisticated tourists” who are “charmed and fascinated” by the city to warrant that title of “honorary San Franciscans”. ‘Tis the night before the start of our our tenth – and longest – stay in San Francisco. And the first to be spent in summer in the enchanted city. We spent a week in the southern neighbourhood of Noe Valley last spring, and whilst much of that time we were elsewhere, we enjoyed its relaxing, civilised atmosphere so much that, when we had to decide where to rent an apartment for four weeks in June this year, we chose it above other likely candidates such as the Mission and the Sunset . This will enable us to acquaint ourselves more with the neighbourhood and adjoining districts as well as providing a good base for visiting other parts of the Bay Area, familiar and previously unexplored alike. So where is Noe Valley? And what we have let ourselves in for by living there? It sits immediately south of the Castro and east of the Mission in a sunny spot protected from the fog by steep hills on three sides. Its borders are broadly defined as between 20th and 22nd Street to the north, 30th Street to the south, Dolores to the east and Grand View Avenue to the west. Our apartment is on 28th Street between Church and Dolores. A look at a map of the greater San Francisco area would suggest that it is relatively remote, and it is undeniably off the tourist trail. But public transit and local roads render it easily accessible to downtown and the South Bay respectively. The J Church MUNI Metro line was our constant companion on our previous trip and will be so again, at least for the first half of our stay before we hire a car for the trip to Tahoe. 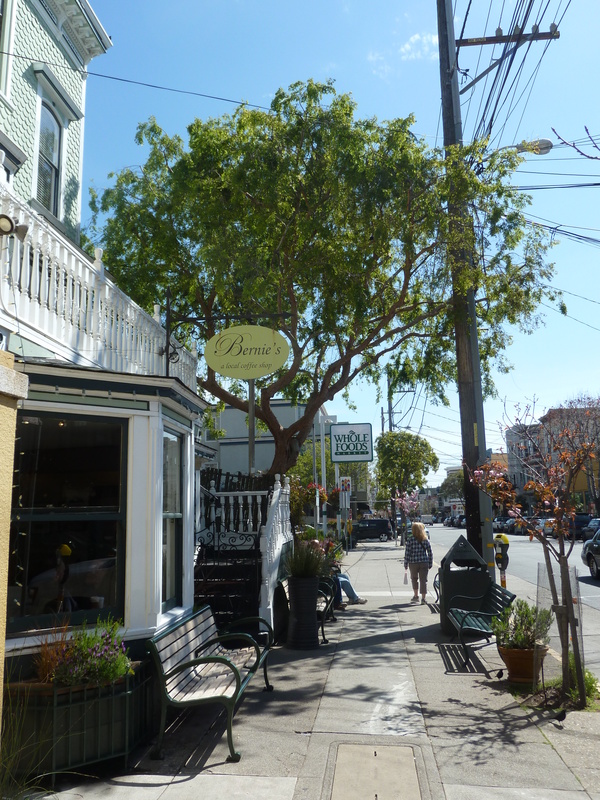 Noe Valley is a quiet but cosmopolitan residential neighbourhood with a classy small town feel. Its preponderance of comfortable, even affluent, young families has lead to a change in its nickname from the hippie-inspired “Granola Valley” in the seventies to “Stroller Alley” today. But it also attracts couples and singles of all persuasions, notably gay and lesbian migrants from the Castro. A healthy number of artists and writers complete a sophisticated demographic. The population of approximately 21,000 comprises 70% white, 15% Hispanic and 7% Asian, with the remaining 8% coming from all corners of the globe. It is blessed with a significant number of classic two storey Victorian and Edwardian homes. Broad streets and brightly coloured exteriors have the writers of guidebooks reaching for words like “cute” and “quaint”. Property prices are inevitably expensive. The neighbourhood gets its name from José de Jésus Noé, the last Mexican alcade (Mayor) of Yerba Buena, the original name for San Francisco. He owned the land as part of his Rancho San Miguel but sold it to John Meirs Horner in 1854. Horner laid out many of the wide streets we enjoy today, and the name “Horner’s Addition” is still used for tax purposes by the city assessor’s office. The main development of what was traditionally a working class neighbourhood came in the late nineteenth and early twentieth centuries, notably after the 1906 Earthquake and Fire. 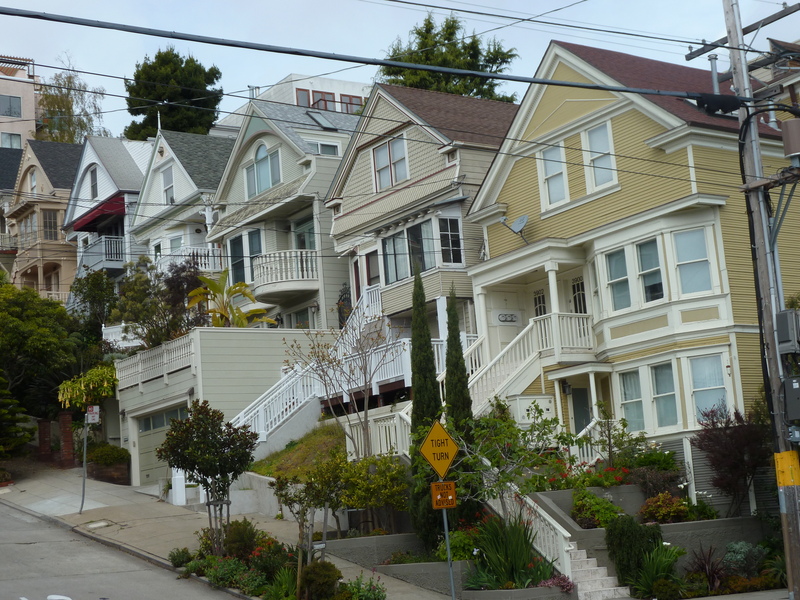 Today, its interest for outsiders lies essentially in the eclectic shopping and dining experience to be found along the stretches of 24th Street from Castro to Church and Diamond to Dolores. Coffee shops, restaurants, one of a kind clothing and gift stores and bookshops abound, along with one of the best farmers’ markets in the city. This will be our fourth apartment – the first two were in Hayes Valley and North of the Panhandle (NOPA) – and, as with previous years, our aim is to blend as far as possible into the local community for the duration. With four weeks at our disposal on this occasion, our “live like locals” strategy has more chance of success than in previous years where we have stayed for no more than a fortnight. 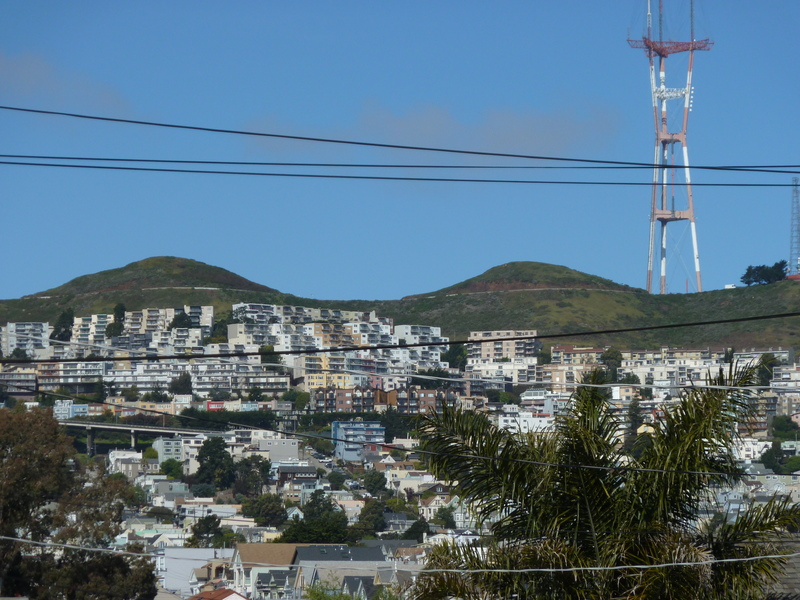 We are particularly looking forward to hiking up Bernal Heights, Twin Peaks and Buena Vista Park, as well as reacquainting ourselves with the Mission. But the extended stay still enables us to satisfy our tourist cravings and revisit the usual suspects such as Golden Gate Bridge, the Palace of Fine Arts, Golden Gate Park , Beach Blanket Babylon and Haight Ashbury, and, of course, three pilgrimages to AT & T Park to support the Giants in their (currently faltering~) hunt for back to back World Series titles. Any trip would not be complete without expanding our understanding of the Bay Area, so Berkeley, the Zoo, Castro Theater and the de Young Museum, all places we have criminally neglected until now, are on our list. Having always , with the exception of our first visit in October, visited in spring, we will be also be able to throw ourselves into four of San Francisco’s celebrated annual events – the Haight Ashbury Street Fair, North Beach Festival, Stern Grove Festival and San Francisco Pride. Our last two vacations have coincided with Crosby and Nash and Elvis Costello gigs at the Warfield. This year, we move to the waterfront at Pier 27/29 where we have tickets for the concert being given by the Steve Miller Band and the Doobie Brothers at the America’s Cup Pavilion. And finally, a short detour to Tahoe is also scheduled. I hadn’t actually realised until I wrote this just how busy we are going to be! San Francisco – your “wandering one” is coming home again.